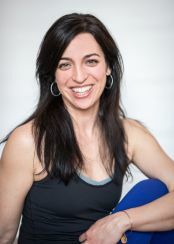 Join Dina for a 40-minute practice that builds to a powerful transition from eka hasta bhujasana (leg-over-shoulder pose) to eka pada koundinyasana II (flying splits). This transition requires super-open hips and hamstrings and a strong core and upper body. We'll work toward it with preparatory poses and flows such as surya namaskar A, flying lunge, side angle, humble warrior, fire log pose, and more.